The Circulations series employ salt to activate encounters in the dynamic inter-relationships of globality and locality. Salt is a ubiquitous form of matter; a material in the hydrological cycle that is essential to life and a potential cause of breakdown of living systems; a substance of historically significant social and economic exchange, whose cultural usage gave rise to food preservation and sedentary lifestyles. Salt is a material in cyclical movement and transformation – through bodies of water, through the bodies of humans and living organisms, and through land – that elicits awareness of the porosity of entities and raises questions of equilibrium and change. The Circulations series draw upon regional resonances of salt: the historical emergence of mercantile practices and wealth through dominating salt trade in the Adriatic; the loss to local economy with the closure of foreign-owned salt pans on Long Island Bahamas; the oceanic imaginary in the Pacific islands; the post-tsunami consequences of seawater flooding agricultural lands in northern Japan and the symbolism of spiritual purification through salt. Our attention is directed to the range of human negotiations with natural systems and resources – commonly containing and capitalising – whilst circulations of salt continue to exceed control. 'Sal (de Sal)' (circulation #0007), RMIT Gallery, performance. Photo Mark Ashkanasy. 'Sal (de Sal)' (circulation #0007), RMIT Gallery, performance. 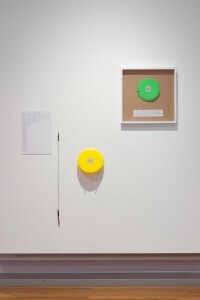 '(Sal) de Sal' (circulation #0007), Margaret Lawrence Gallery, installation view. Photo Christian Capurro. '(Sal) de Sal' (circulation #0007), Margaret Lawrence Gallery, performance video installation view. detail of Photo Christian Capurro. '(Sal) de Sal' (circulation #0007), Margaret Lawrence Gallery, performance video installation view. Photo Christian Capurro. 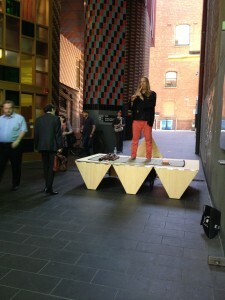 'Sal (de Sal)' (circulation #0007), RMIT Gallery, performance. Photo Felipe Cervera. '(Sal) de Sal' (circulation #0007), Margaret Lawrence Gallery, performance video installation view. 'Circulation #0002', performance installation, Zooming Fluid States Festival, Rijeka Croatia 2014. 'Sampling Salting Sounding' (circulation #0004), performance installation, Long Island Bahamas 2015. Video stills, Denise Batchelor. 'Circulation #0001', performance encounter for two, whilst boiling seawater for salt, Port Melbourne 2014. 'Performance Search Notice' (circulation #0005), first issued on occasion of the Oceanic Performance Biennial 2015, Rarotonga. 'Backflow' (circulation #0006), participatory performance event, Aomori Museum of Art, Tohoku Japan 2015. Mick Douglas is floating in a water basin, attempting to maintain an equilibrium. Amaara Raheem scoops salt on his body. As the amount of salt increases, Mick’s body is pushed down into the water. When the water touches the salt, it begins to dissolve, thus reducing the downward push on his body while at the same time the salt dissolving into the water increases the mass per volume of the water and, with it, the upward push to Mick’s body. Performance takes the shape of a constant rebalancing in response to the changes brought about by the material transformation of the salt from solid crystals to solution. This may be considered a posthuman performance in how it decentralises the human performer. Mick’s role is that of a sensor detecting changes brought about by the salt in the milieu in which his body finds itself, rebalancing itself in response to these changes. Perhaps we could consider this performance an embodiment of the rebalancing of ecological systems in response to processes of salination and desalination as they result from (among others) agricultural irrigation, desalination plants, and dams created to offer protection from flooding. Witnessing Mick’s performance in the water basin, and earlier in a gallery covered in a thick layer of salt, I am reminded of the intensity of Butoh. His performance has a similar intense physical concentration and responsiveness, and, like Butoh, it is not about the expression of individual identity that has been such an important trope in much body art and performance. Instead, the intensities channelled by his performance have a kind of abstract quality that is reminiscent of Land Art works; these contemporaries of body art and performance that mediate in relating to a larger environment and in developing understanding of the environment from bodily engagement. Drawing attention to the performance of salty water, Sal de Sal brings to mind Robert Smithson’s Spiral Jetty (1970), the remarkable construction of basalt rocks in the Great Salt Lake in Utah. The spiral structure created by Smithson is sometimes visible and sometimes not, depending on the level of the water in the Great Salt lake. Its becoming visible and invisible marks the transition of huge amounts of salt from solid to solution, and vice versa. When visible at all, the structure is sometimes like a spiral dam dividing the water, sometimes it is a sculpture in a desert of salt. The series of performative interventions of which Mick’s ‘pickled Butoh’ in the water basin is part, draws attention to the performance of salt as something Donna Haraway proposes to call ‘NatureCulture’ (The Companion Species Manifesto, 2003). With this, she points to the inevitable entanglement of the natural and the cultural, the body and the mind, the material and the semiotic. The series of works presented during Fluid States under the title Sal de Sal similarly draws attention to this entanglement. Salt is a mineral with certain characteristics that make it appear as solid in certain conditions and as solution in others. Salt is nature. Yet how, when and where it appears as either solid or solution is entangled with culture, with the cultivation of land and water, with the various uses of and struggles with salt, and with the value of salt in different cultures. Salt crystallises and dissolves at the intersection of nature and culture.